Friendship is fraught with drama—especially if that friendship is between two of the greatest dramatists of the twentieth century. Theater critic-turned-playwright Terry Teachout puts a fictional twist on the real-life friendship between Tennessee Williams and William Inge in Billy and Me, currently onstage as part of a world premiere run at Palm Beach Dramaworks through December 31. 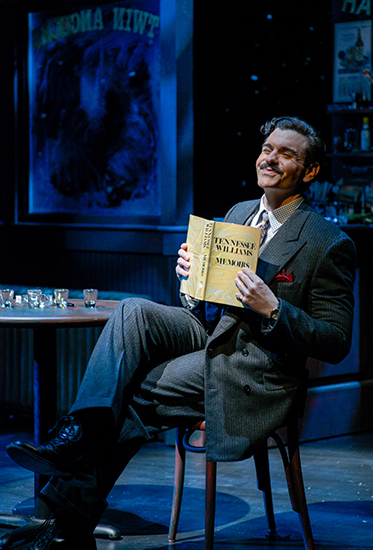 An exquisite balance of poetry and truth, Billy and Me is “a memory play about a memory play.” As with Tom in his masterpiece The Glass Menagerie, Tennessee Williams acts as both narrator and character in this instance. His pre-death musings bookend two acts, with the first taking place in a Chicago bar in 1944 and the second at Inge’s fancy Manhattan apartment in 1959. In Act I, Williams is awaiting Inge’s critique of Menagerie, which has just premiered at a nearby theater. Despite his day job as a drama critic, Inge longs to be a playwright, too. Billy and Me’s first hour is devoted to Williams lecturing Inge about the importance of honesty as the base for any good drama. “Start with the truth and then make it more beautiful,” he instructs a muted Inge. Silenced by his inability to accept his true self, Inge has struggled to pen a worthwhile play. But all that has changed by Act II. Now a very rich man, Inge has written four hits in a row, whereas Williams is struggling with a critical dry spell. But luck is running out for Inge, who receives the first poor reviews of his life for A Loss of Roses. Faced with the fear of failure, Inge turns to prior vices. Williams is there to save him, for the time being. But his elegant harangues about artistic integrity cannot correct Inge’s innate self-doubt, relegating Billy and Me to a devastating, albeit truthful denouement. Nobody but Terry Teachout could have written this play. Most famous as the drama critic at The Wall Street Journal, Teachout imbues Billy and Me with numerous references to the mechanics of the theater and out-and-out disses to the profession of criticism. While Inge starts as a critic, he clearly views this as a lesser calling. Does Teachout feel the same way? Who knows. But Billy and Me, which is his second play, devotes many minutes to looking at how criticism impacts the creative process. By the time the second act rolls around, Williams, who was previously so terrified of what poor reviews would do to his career, is imploring Inge to forget about the press and focus on his art. These dramatic flourishes would fall by the wayside if not for actor Nicholas Richberg’s superb delivery. From his stance to his prance, Richberg perfectly embodies Tennessee Williams, a man who valued truth yet worked under a pseudonym. Richberg brings an undeniable bravado to his portrayal, but undercuts it with a palpable sorrow. Part of that is in the script; on multiple occasions, Teachout has Williams flash back to past sins surrounding his relationship with his sister, Rose. But Williams would be all swagger and no soul if not for Richberg, who reaches into the character to unearth the humanity beneath the ego. Tom Wahl’s William Inge is completely different. Where Williams is all external, Inge is totally internal. Where Williams does most of the talking, Inge does a heck of a lot of listening. Where Williams is a man of many, many, many words, Inge is more economic with his speech. Wahl rises to each and every one of these challenges. He builds a character that is like a frozen lake, impenetrable at the surface yet exceptionally vulnerable underneath. More than anything, Inge is scared—of critics, relationships, and, most importantly, himself. 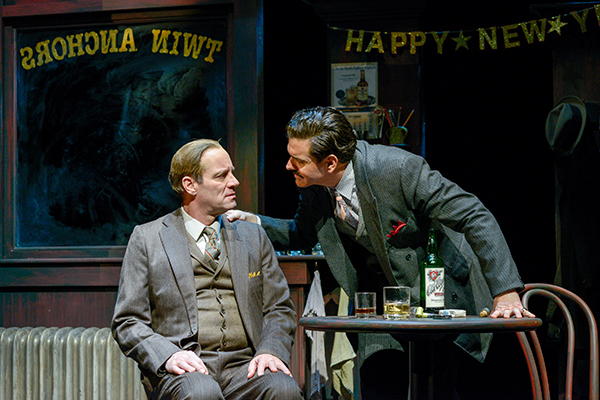 Wahl succeeds at portraying a man who is detached from his own truth while seeking to convey utter honesty on the stage.